Got a fun sketch from Raise The Bar, and they're celebrating their 100th challenge! It's a pretty fun one too, see how it resembles the number 100? 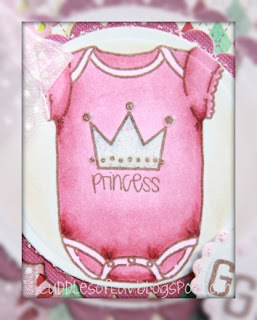 The stamp image is from TGF Build A Onsies Girl set, and I have the boy set too! Finally got a chance to ink it up and thought it would be fun to make a few small gift cards (4x4 size). So far I only made this one... LOL! The Farm Fresh Friday Challenge is to use classic patterns paper, so I chose "argyle" with fun colors! I'll be inking up my boy Onsies set soon, but there's some birthday cards I need to finish for this weekend! I'll be sharing those with you soon! Awww, this is so cute! Fab design and I love that sweet ribbon on this card! 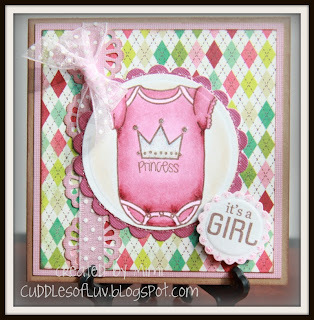 Adorable baby card...love the fun colors! Thanks for playing along with us at Raise the Bar! Such a great baby card! Love the onesie! Have a great weekend! Super cute Mimi!! I love the pinks and the coloring details. The ribbon and elements you used to make the 100 are perfect. Gr8 job with the sketch! You've been busy and I've really been enjoying all of your posts. Have a fun-filled weekend!! so sweet Mimi, I really like the background paper with this design! !